So this is apparently one of my more popular beauty series, and I get asked how I did it. I figure it’d be a good idea to use this as an opportunity to start my “How it was done” series of posts here. A little background info: I’ve never been big into beauty, I shot it from time to time mostly to just appease makeup artists and give them more of an incentive to test with me on shoots. Then mid-2013 on a whim I decided to revisit the idea and add some stuff to my portfolio. Every couple months I’d do another shoot or two, leading up to present day when I’ve decided to focus more on beauty as opposed to any fashion work for the foreseeable future. Onto the image: The goal of this particular shoot was to get some really clean, commercial beauty. I was inspired by some of the photos you usually see when you’re walking through Target and you pass the cosmetics aisles, there’s usually some super clean display photo from Clairol or Revlon, etc. Up until this point, I had been doing “clean beauty” but mostly with more of a moody vibe, usually shot in black and white. This time I wanted to do the same, but get a nice, crisp shot in color. Long term I’d like to do a dozen or so more of these with varying concepts but all within the same theme…but I think this was a good start. The setup: Typically I use one of two modifiers for my main: a beauty dish in one of three configurations (with sock, bare/without sock, or with grid), or a medium rectangular softbox. The bare beauty dish is easily the most used by far and this is the case for this image: bare Alien Bee dish (older style). 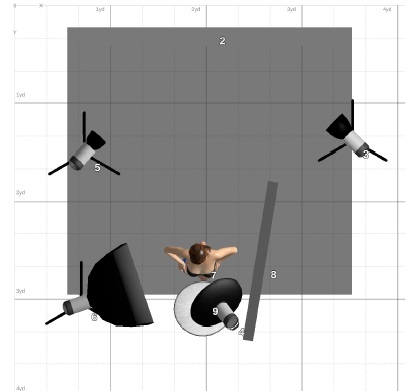 I typically place the dish rather close to the model, usually no more than 2′ away at most. In this case you can see from the catchlights and the soft loop shadow on the nose that it was just above eye-level and barely off to the right (camera right that is). In addition, I’m a huuuuge fan of V-flats and fill cards. The studio I was at didn’t have any v-flats, so I ran out to the 99 Cents store and got a couple white and black foam core sheets. 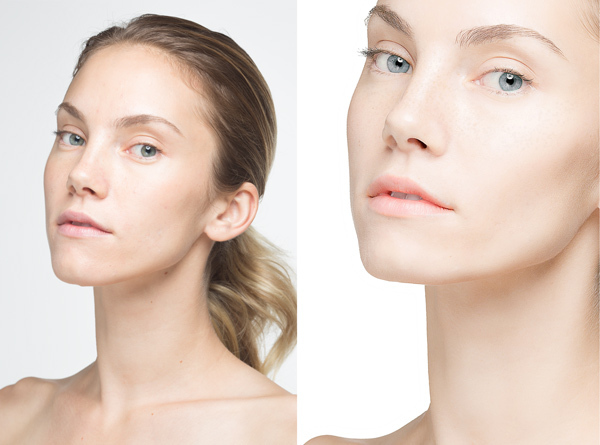 In this example there is one to the models left (camera right) very close providing a little fill light. There is also a round white reflector just under the frame and more or less against her chest (held in place by reflector stand), aimed up to provide fill under her chin. 2 more Bee’s and 7″ reflectors aimed at the background behind her to brighten it up (originally the goal was a very light grey, which we achieved in camera on set….but afterwards in post I decided to go white). And that’s pretty much it. There’s a good bit of post-work, but that’s par for any beauty shoot in my experience. Mostly dealing with evening out skin tones and a few minor blemishes. I chose to do a more aggressive crop to focus on the face and skin quality as the hair wasn’t really important to the final image. Status Update: Lighting setups coming soon! I know I’ve been slacking off big time on updating this thing, but I’ve just been busy with work lately doing a lot of retouching. Haven’t even had many opportunities to shoot these last few months, though I do plan on hopefully remedying that this spring. In the meantime I’ve been getting a lot of questions about various images along the vein of “How’d you do that?”. So I figure what better to start posting on this blog than how-to’s, behind the scenes images, before/after’s, and lighting setups. If all works out the way I hope I’ll be able to give a look at a lighting setup, and ideally work through a basic retouch on here to show how I “get that look” for some of my photos. That being said, I’ve already created 3 diagrams for popular photos I keep getting asked about, but if there’s anything specific you’d like to see feel free to ask and I’ll see what I can do. First one coming up later today! Don’t let your gear limit your creativity!